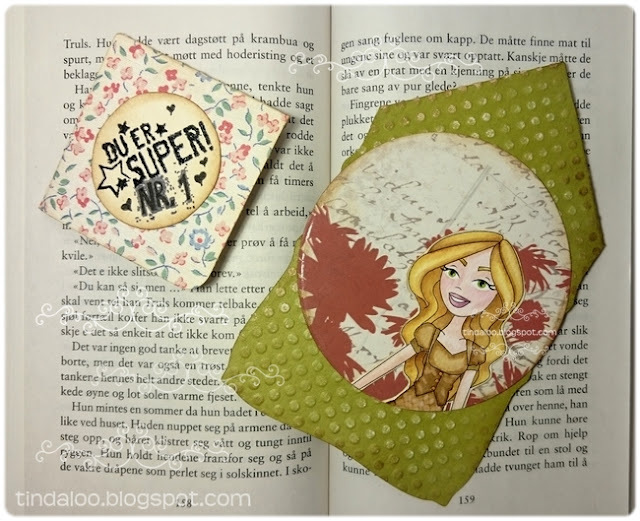 Tindaloo in CyberSpace: Sassy Bookmarks! Så nå har jeg har lagd noen bokmerker som mitt GDT bidrag til SSD's September Progressive Utfordring, som foregår på facebook gruppa deres. Niesen min blir sikkert glad for få disse til skolebøkene hennes ♥ Jeg har sikkert et dusin bokmerker selv her og der, 'eselører' er jo ikke særlig pent! ..You are Super/Awesome! ♥ No.1.. I was so lucky to win last months Progressive challenge at SSD's FB group, and I have received some lovely new digis off my wishlist! I also got to be a GDT for Sassy Studio Designs this month, so I'm not participating in the Prog.ch. only doing a show & tell of the September image! or slide down on the page from the top, as showed above. And books will be happy to not get 'dog-eared'! Digital Delights! Thanks :) All my award badges are on my About me page. Stamps/Images: Sassy Studio Designs SSD digistamp 'School Day Dayna'. Papirloftet Clearstamp 'Denne bok tilhører Kewpie'. Kort & Godt 'M-225'. Panduro Hobby Vibeke Spigseth - PoppyDesign 'Fraser Tekster 510122'. Papers: Co'Ordinations cardstock. Plain white cardstock. '..'. Embellishments/Tools: Spellbinder Nestabilities 'Curved Rectangles S5006'. Crafters Companion Embossalicious 'Petite Dot' 6x6 Embossing Folder. Crafts Too Presscut 'Circle Nest Dies PCD46'. Misc washi tape. Techniques: I always use my Scor-Pal to score n fold my cards. I prefer Canson Montvale aquarelle paper (200 g/m coldpressed). My distress tools from Ranger Ink is always in use! ~ Tim Holtz® Mini Ink Round Blending Tool & the Inkssentials Ink Blending Tool and Foams. I used misc. Luminarte Twinkling H2o's Shimmering Watercolors, and Tim Holtz Distress Ink pads & markers to watercolor and distress image and papers. Sandpaper to sand the embossed areas. The text stamp is heat embossed in 'Black Soot' Distress ink, Ranger Clear Embossing powder & my Heat-gun tool. Pigma Micron pen for details & doodling. Your bookmarks are gorgeous, so useful too! I'm sure your niece will love using them. Thanks for sharing with us at Sweet Stampin' this week. Wowww i love your bookmark!!! Thanks for joining us at Brown Sugar Challenge this week! Lovely creations. Such cute bookmarks. Thanks for joining us at Morgan's Artworld for our "For the Kids" challenge. Good luck. Hope to see you again soon. So fun! Thanks for playing along with Frosted Designs!!!!! 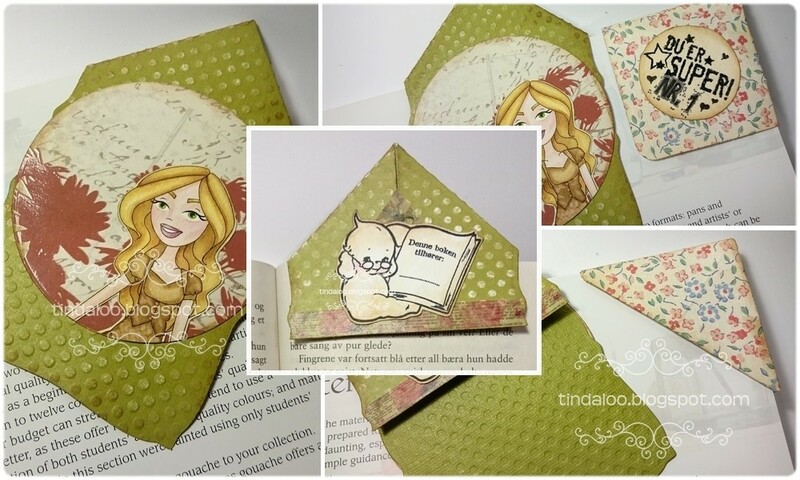 I really love what you did with our color palette, this is a gorgeous, autumn, warm bookmark. Thank you for joining us at Pile It On and please come back for the newest challenge.